Shoulder seasons are always a good time to troll for travel bargains . And for a dude ranch vacation, this spring brings a saddlebag full of great deals. Here are a few 2009 ‘Spring specials’; for more, go to the www.ranchweb home page and click on the Bargains link. Set the hook for great fishing at a 15% discount. Get an early start on the Montana fishing season at Lone Mountain Ranch, set amidst Southwest Montana‘s famed Blue Ribbon trout streams. 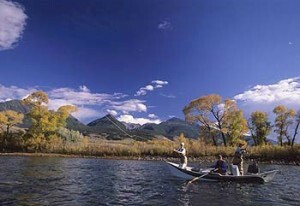 They’re just four miles from the Gallatin River; their Orvis Endorsed Guides usually access the Madison and Yellowstone rivers in a dory style drift boat (seen at right). The 6 night/5 days of fly fishing package is $2700/person (based on double occupancy in a small cabin) and includes 6 nights lodging, 5 days guided fishing, 3 meals daily, fishing license, flies and shuttle to and from the airport in Bozeman, Mt. The 4 night/3 days of fly fishing package is $1740 per person ( based on double occupancy in a small cabin) and includes 4 nights lodging, 3 days guided fishing, 3 meals daily, fishing license, flies and shuttle to and from the airport in Bozeman, MT. The savings: 15% off. Contact: when you call, be sure to mention “Ranchweb Travel Bargains”. 800/514-4644 or 800/ 514-4644 or click here. Rancho De La Osa Guest Ranch; Tucson Arizona. Deal: Spring 2009 Getaway Special – 5th Night Free- 20% Discount (approx). Details: Book four nights and get the fifth night free at Rancho De La Osa from April 1st through May 31st. You’ll find warm, sunny days and the desert in bloom! Offer is valid only for reservations booked directly with the ranch and no other discounts or promotions apply. Please mention RanchWeb to receive a complimentary upgrade to one of our Deluxe rooms. Contact: 800/872 6240 or 520/823 4257 or click here. Red Horse Mountain Ranch; Idaho. Deal: 2009 Spring Weekend Getaways. Details: Good March 29, 2009 to Apr 26, 2009. Getaway to cozy accommodations in guest cabins and lodge suites, hot tubs, and home cooked breakfast, lunch, and dinner. On Friday night, enjoy a candlelight dinner and a cowboy poet/songwriter playing guitar by the main lodge fireplace. Saturday night brings a 7-course dinner featuring a variable select wine assortment and champagne. When you call, be sure to mention “Ranchweb Travel Bargains”. Contact: 888/689-9680 or 208/689-9680 or click here. Stagecoach Trails Guest Ranch; 140 miles from Las Vegas, NV – 220 miles from The Grand Canyon and Phoenix, AZ. Deal: 2009 Spring Getaway Special. Details: Three-Night Special on stays between April 27-May 3, 2009; $399 single occupancy $329 per person double occupancy $299 per child age 4-11 represents about a 30% savings. When you call, be sure to mention “Ranchweb Travel Bargains”. Contact: 866/444-4471 or 928/727-8270.